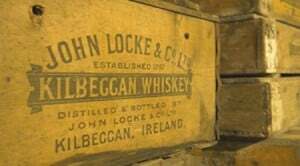 Come with us on our Pub Tour of Locke’s Distillery in the small town of Kilbeggan. The Museum is open seven days a week and there is a choice of a self-guided or guided tour. The guided tour takes about 40 minutes and shows the ancient process of whiskey making from the mill stones, to the mash tuns, underbacks, fermentation vats and pot stills to the casking of the final product. This distillery is the last remaining example of a small pot still whiskey distillery in Ireland. It was licensed in 1757 and whiskey production continued until for 200 years until 1957, when the distillery closed its doors. John Locke took over the distillery in 1843, from when it remained in the hands of the Locke family for many years, being inherited by Mary Evelyn and Florence Emily, granddaughters of John Locke in 1943. In 1947 the distillery was purchased by The Transworld Trust. This, together with the economic depression of the 1920s and 1930s, took its toll on Locke’s and on 19 March 1954 production ceased, with the distillery closing completely in 1957. Locke’s used three natural raw materials required for distillation, turf for heat, locally grown grain and pure water from the river Brosna were readily available. The Locke’s were considered good employers. Many of the houses in the town are distillery houses which the workers rented or gradually bought out. The distillery also provided an area of grassland behind the distillery known as the “Cow and Calf” park. Here they allowed workers who did not have their own land to graze a cow and her calf during the day for the sum of £5.00 per year. Other benefits included the delivery of a full load of coal to the workers homes at the beginning winter, payment was then deducted from their wages during the coming year. In 1866 the boiler at the distillery blew up and the owners of the distillery did not have enough cash at the time to replace it. John Locke was in despair as the boiler was an essential part of the distillery. Knowing of his plight and due to being held in such high regard the people of Kilbeggan presented him with a new boiler. A plaque commemorating the event from the people of the town dated 1866 hangs in the reception area of the restaurant at the distillery. Today the distillery is known as Locke’s Distillery Museum, and includes a restaurant and a 19th century waterwheel that is in working condition. The distillery can also be powered by a steam engine, which is in working condition but rarely used. It was installed to allow the distillery to continue operating in times of low water on the river. Whiskey production recommenced in 2007, the year in which the distillery celebrated its 250th anniversary. Open all year with a whisky bar, gift shop free car and coach parking and restaurant. A visit to Locks Distillery is a unique experience not to be missed! Places are limited so contact us now!